DraftKings -The Steelers trio will leave you with just $4,016 remaining per player to fill out your roster. Start with the cheapest positions, defense and tight end, before considering which skill position players to add at the RB/WR and FLEX spots. We feel pretty comfortable starting the New York Giants defense, the 7th cheapest defense available, even with Ezekiel Elliott eligible to play. Two of Dak Prescott's three worst games of his rookie campaign came in his NFL debut against the Giants and in week 14 at New York. He averaged less than 200 passing yards per game in both losses. The Giants have one of the best run defenders in the league in Damon Harrison, with Olivier Vernon and Jason Pierre-Paul coming off the edges. Dez Bryant only caught two of his 14 targets in those games thanks to one of the best secondaries in the league, led by Dominique Rodgers-Cromartie Janoris Jenkins and Landon Collins. After picking Ertz, you are now are left with $4,500 per player remaining for one RB, two WRs and a FLEX you have a lot ways to make it work. There are four RB1's available under that average, but the Lions vs Cardinals matchup is not one we want to invest in, so Ameer Abdullah ($4.3k) is out for me. Now as we shift our focus towards the WR position, one name that stands out is Jordan Matthews ($4,400). Priced before his trade to the Bills, he will be one of the most popular plays week 1 against that Jets secondary. If you add Matthews to your roster, you now have $9,300 left for another WR and to fill that FLEX spot. Looking for a contrarian pick at WR? Rishard Matthews ($4,200) and the Tennessee Titans have a plus matchup against the Oakland Raiders. At $5.1k, Brandon Marshall could be a nice play against a week Cowboys secondary in his debut with the Giants. You can save $300 and go with the Kenny Britt, who is the king of garbage time. There will be plenty of that as he makes his debut with the Browns, who we started stacking this lineup against. Terrelle Pryor averaged 95.5 yards and had 21 targets in two games last year against the Steelers. With Brown, Matthews and Britt as your WRs you are left with $4.5-4.7 to fill the FLEX position. 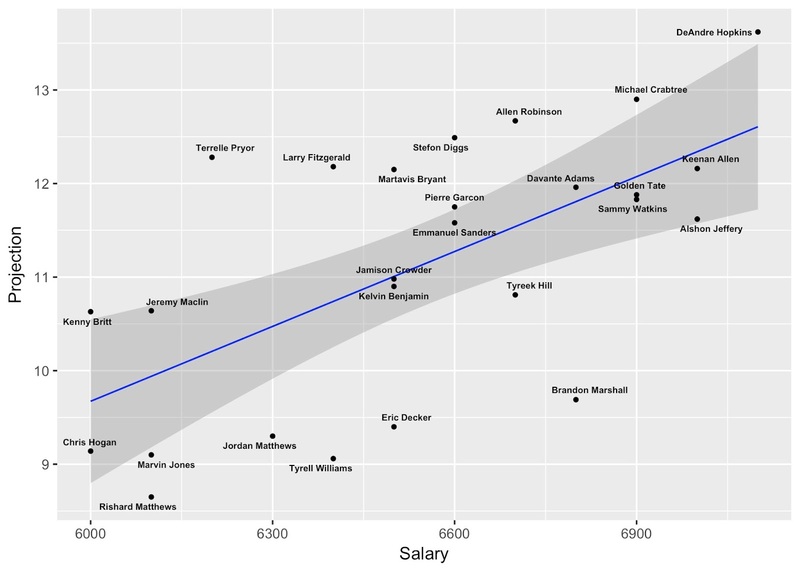 FanDuel - As both sites have different roster constructions, they also both have different salaries and salary caps. FanDuel plays kickers, does not have a FLEX spot and gives you $10k more. 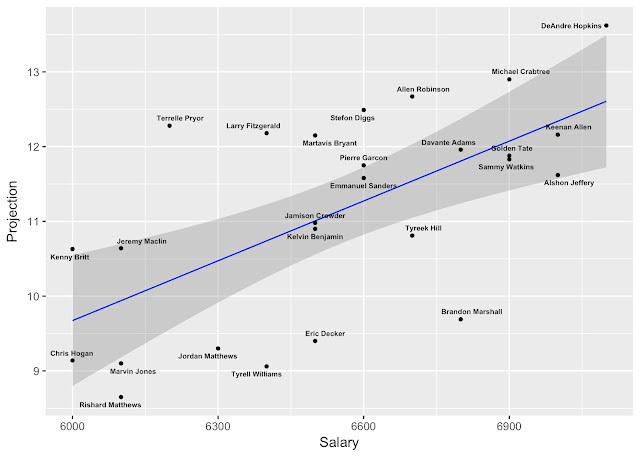 After adding the three Steelers to your lineup, you are left with $5,567 per player. Lets shift to the defense and kicker positions to see what we will have left to spend on RB/WR/TE positions. The Giants defense is priced right in the middle of the pack, $500 more than the lowest priced defense but you can save $600 compared to the Houston Texans. Let's keep them in our lineup for now but feel free to spend $200 more on the Bills defense against the Jets. There is just a $500 difference between Justin Tucker and Blair Walsh. If we pick one right in the middle at $4,700, like Matt Prater, we are left with $6,050 as we look to select a TE. 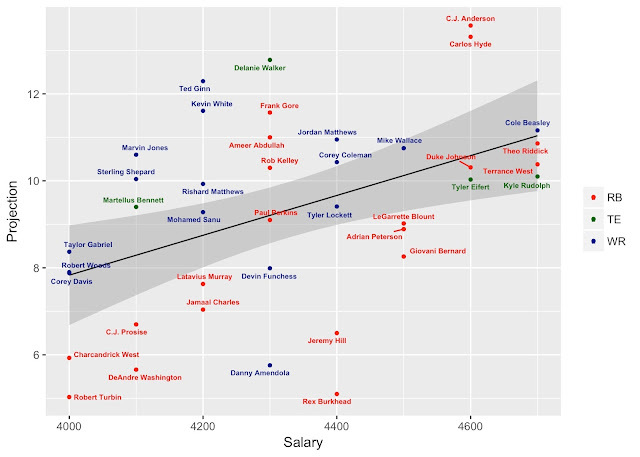 Just like with DraftKings, those same TEs are all priced above our average, but this time Delanie Walker joins them. Ertz is priced more fairly on FanDuel but we love the matchup. Now with $6.1k left for a RB and two WRs, let's find a value WR to see how much we can spend on that 2nd RB. Jordan Matthews is going to be chalk, but at $4.6, his value is not nearly as good on FanDuel. For tournament play, let's find an undervalued WR. Do your research on the Houston Texans situation with Will Fuller out. Braxton Miller ($4.9k) will have plenty of opportunities against the Jaguars if he can recover from an ankle injury. Jaelen Strong ($5k) is facing a possible one game suspension (weed) Keep in mind, the Texans have named Tom Savage the starting QB. If Miller is too risky for you, how about the Bears Kendall Wright for $300 more? With Miller, we now have $13,400 to spend on a RB and WR. If you decide to pass on the Bills as your defense, Jets Bilal Powell ($6.3k) is a solid play and leaves you with $7,300 to find your third WR. If you did pick Buffalo's defense, you should consider spending $300 more on Ty Montgomery. Depending on which RB you select, you can have your pick of the following WRs to complete your week 1 entry.